In 2001, the Taproot Foundation was founded to make the pro bono service ethic part of every business profession and ensure all nonprofits have access to the professional talent they need to serve the communities and advance collective progress. Their groundbreaking Service Grant program demonstrated the ability for pro bono service to bridge into the mainstream business community and deliver reliable results for hundreds of nonprofits across the country. It delivered services across a wide spectrum of functions from finance to technology, clearly expanding beyond the traditional advertising and legal precedents. In 2007, the program was noted as the nation’s largest nonprofit consulting firm. To expand pro bono service beyond the Service Grant program, in 2008 Taproot expanded its efforts to become the leading national advocate for pro bono service. Inspired by President Kennedy, Taproot’s founder Aaron Hurst lobbied the President to create a parallel challenge to the business community to use their skills to help the nation in a time of critical need. The result was the White House campaign : Billion + Change. In 2011, pro bono service is rapidly gaining traction in the professions. The AIGA (professional association for design) Pro Bono Design Program recently challenged designers to devote 5% billable hours to service and American Institute of Architects in 2011 integrated pro bono into its code of service. 80% of top business schools engage students in supporting pro bono. Today, over two hundred companies and over $2 billion in corporate pro bono resources have been pledged to the Billion + Change campaign. To further advance the marketplace, Taproot has partnered with the Committee Encouraging Corporate Philanthropy (CECP) to create industry standards and benchmarking for pro bono service. 30% of companies now report that they offer pro bono opportunities to employees. With the growing confidence and interest in pro bono service, new pro bono providers are emerging quickly. These range from formal corporate programs (over 30 of which have been designed in partnership with Taproot) to new standalone providers worldwide to traditional volunteerism and capacity building programs expanding into pro bono service. Most recently, the technology community has begun to embrace the power of pro bono. 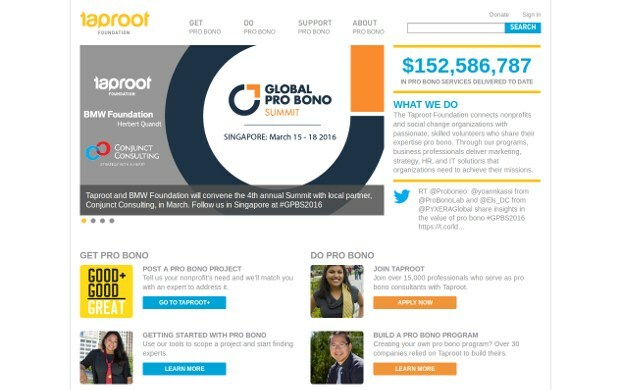 LinkedIn, the largest professional network in the world, has made pro bono their core social strategy and is working closely with Taproot to realize it. Still, while the supply of pro bono services and programs is rapidly growing, the need in the nonprofit sector remains significant.